Instant play with colour chord system! A collection of well-known songs using just 2 chords per song. This is a book for the beginner (any age) or for those who play a little and need some extra easy songs to practise what they know. Basic instruction is given and relevance of the ukulele to the guitar is included. The downloadable audio tracks are recordings of all the songs – with lead vocals, ukulele and full band accompaniment. 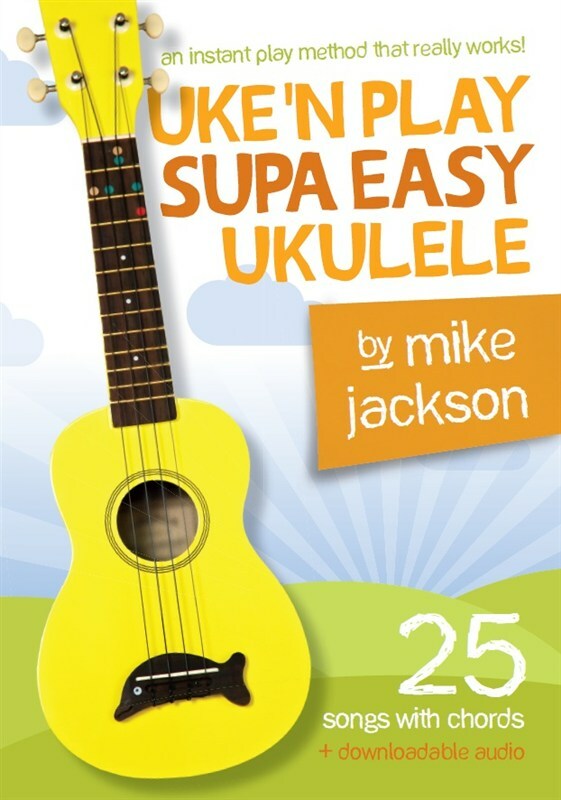 Learn to play ukulele online now with Mike’s Instant Play Ukulele Method! Helpful Hints for Beginner Ukulele Players. Oh, Dear! What Can The Matter Be? Listen to Michael Jackson on ABC Radio’s Ask the Experts discussing ukuleles, how to buy a good ukulele and some useful hints about ukulele playing. Campfire Songbook – with midi files. We sell & recommend Kala Ukuleles. Please view the Kala site and then email us here with the description & code of the ukulele you want. Jane English on Welcome to Our New Site!